Snacking is an essential part of healthy eating. It’s not ideal or necessarily healthy to live off of 3 meals a day. You’ll ping pong back and forth between hunger that brings on a less than savory attitude and fullness that makes you want to first unbutton your pants and then pass out for a few hours. Instead, you slowly have to get used to always feeling content—i.e. never too full or too hungry. I admit it’s a hard line to walk. As a culture so used to feeling stuffed, it can be hard to stop before you reach that point. That’s why having an arsenal of snacks at your disposal is important. Make room in your purse and backpack for fruits (fresh and dried), sliced veggies, and healthy yogurt. These foods are easily transportable, but sometimes you want something a little more “decadent” for when you’re at home and can lounge around while noshing. This past week, in the comfort of my kitchen, I tried out a little mix-and-match that delivered tasty results. So, I love smoked salmon. Like, adore smoked salmon. It’s a little slippery, a little chewy, and a little salty. Plus it has your omega-3s and protein. If you’ve ever been at a party that serves smoked salmon, the fishy goodness is probably encasing a wad of cream cheese. As delicious as cream cheese is, it’s not something I want to add to my diet on a regular basis. And as delicious as raw salmon is on its own, I wanted something extra to help fill me up. And then it hit me: find something sweet! 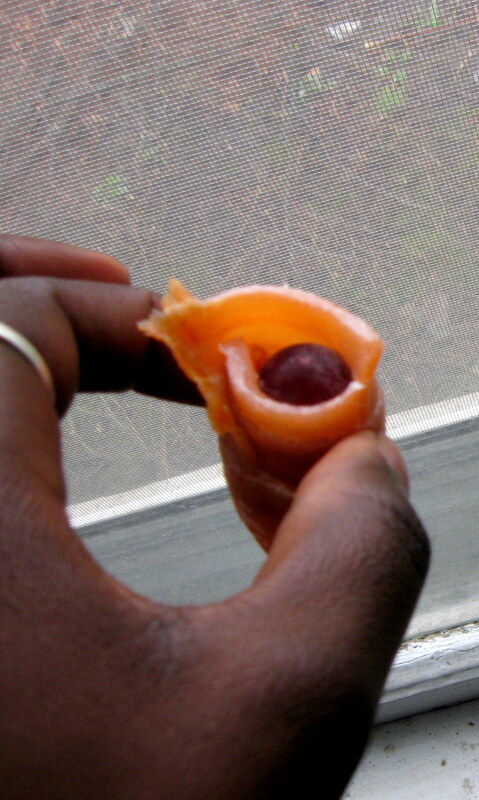 I perused my refrigerator and freezer until my fingers settled upon the bowl which was holding some frozen red grapes. 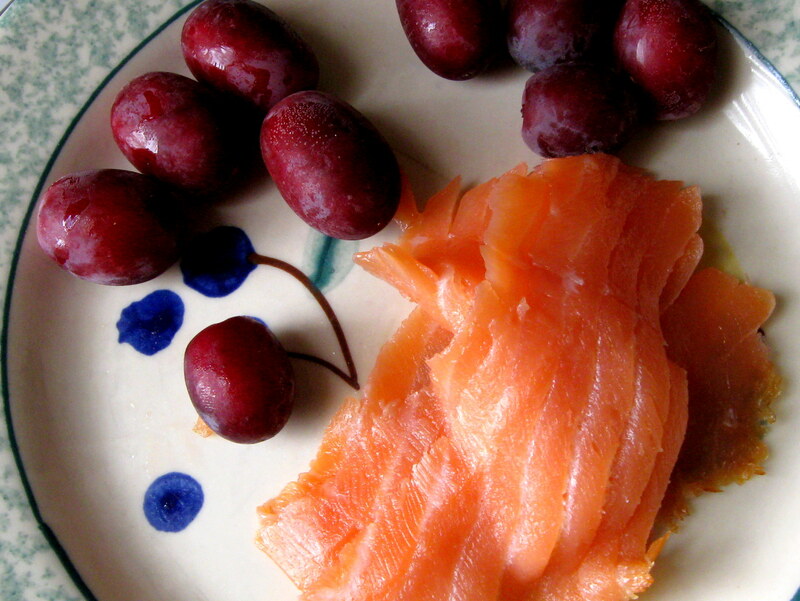 I love, love, love freezing my red grapes, because it makes them at least 3x sweeter—think healthy “candy.” I wrapped the grape up in the salmon and popped it into my mouth. A-friggin-mazing. I settled on this delight yesterday during my 15 minute break at work. In my bag I had a jar of peanut butter, an apple, and some pitted dates. An apple didn’t seem that appetizing, and it’s too depressing to eat peanut butter off a knife. So, I told myself, why not slather some peanut butter on my dates, which had been perfectly warmed and gushy-fied from sitting in the car all afternoon? Heaven. The sweetness of the dates made me think of peanut butter and jelly sandwiches, sans the jelly which is usually filled with added sugars and the bread which is carb city. An important aside, I strongly encourage everyone to develop a taste for natural peanut butter. Until recently I was stuck on the generic kind, which isn’t that much worse from you, but has a lot of added fats and chemicals that are unnecessary. Chris had always been a fan of the natural PB and would sanctimoniously hold his habits over mine. Oh, the shame I felt for many months. One random day I finally worked up the courage to try his stuff. It definitely wasn’t as sweet as what I’d been eating, but it wasn’t as bad as I thought. After I few tries I was hooked on Teddie’s and haven’t looked back since. Don’t be afraid to play mad scientist with your snacks. Who cares if it’s weird as long as it tastes great to you and is nourishing your body? I love fruits and veggies, but, not going to lie, sometimes even I get bored of chopped peppers and fuzzy, wuzzy Kiwis.